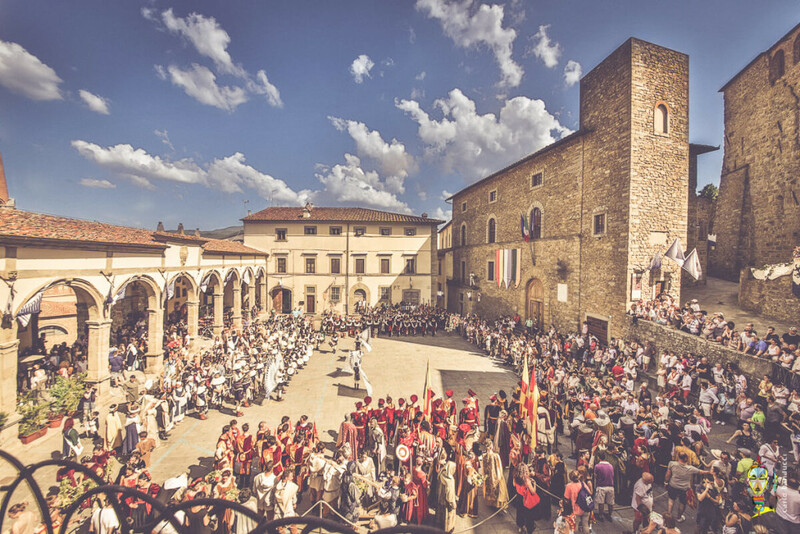 In Castiglion Fiorentino, in the heart of Tuscany, every year takes place a recalling that fascinates locals and tourists, reviving the emotions of the ancient medieval traditions. 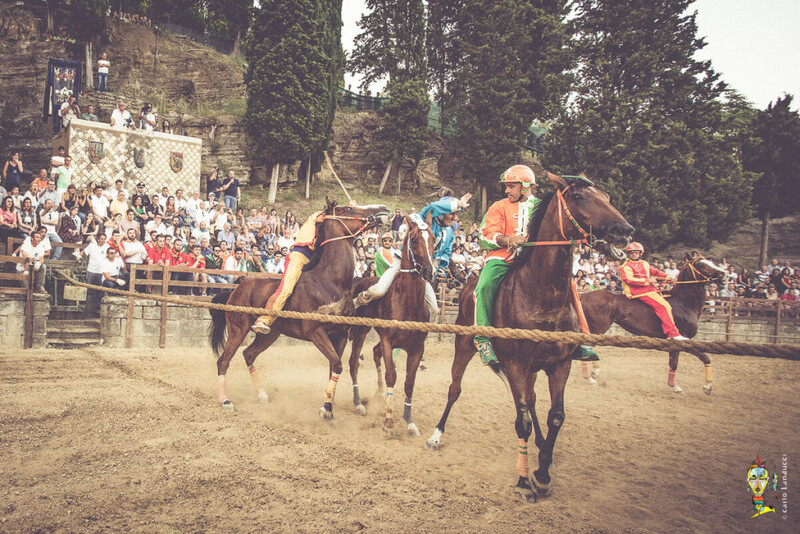 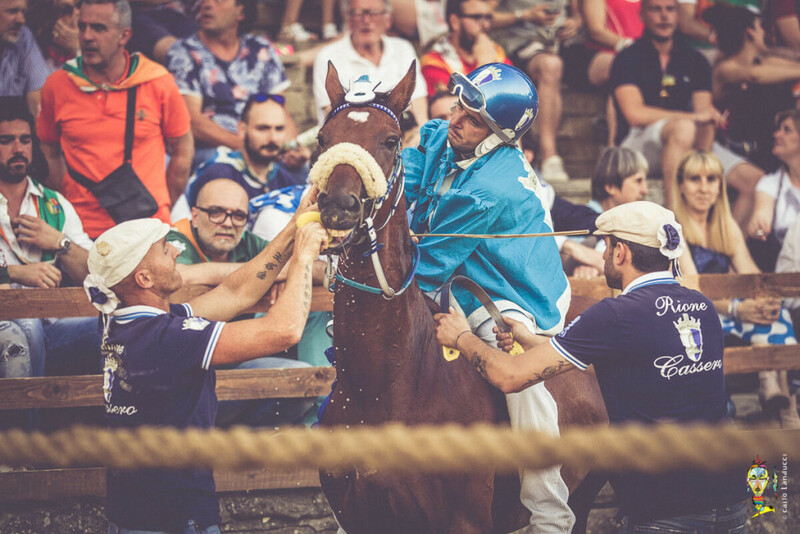 A folk festival that takes place the third week of June and ends with the Palio dei Rioni, a heartfelt horse race, waited with great fervor. 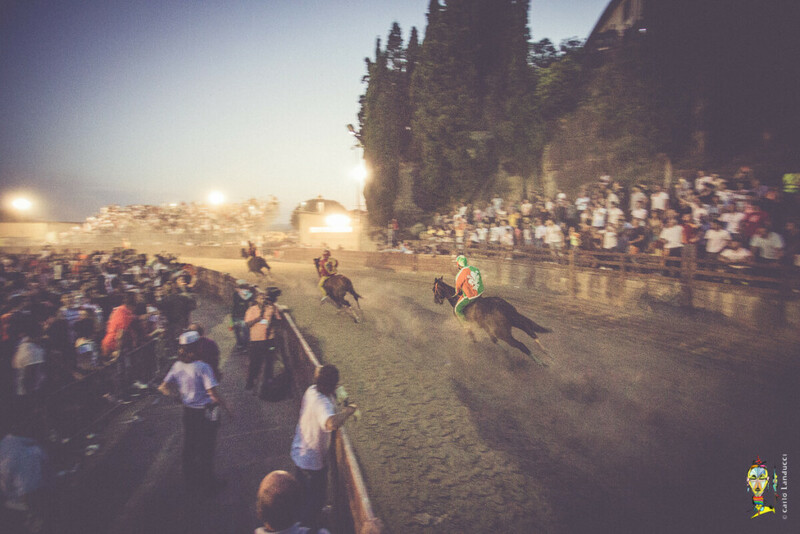 The Palio dei Rioni falls on the feast in honor of “Our Lady of Grace” of Rivaio, so called because of the tables and of the votes that were taken by believers to give thanks for escaped dangers. 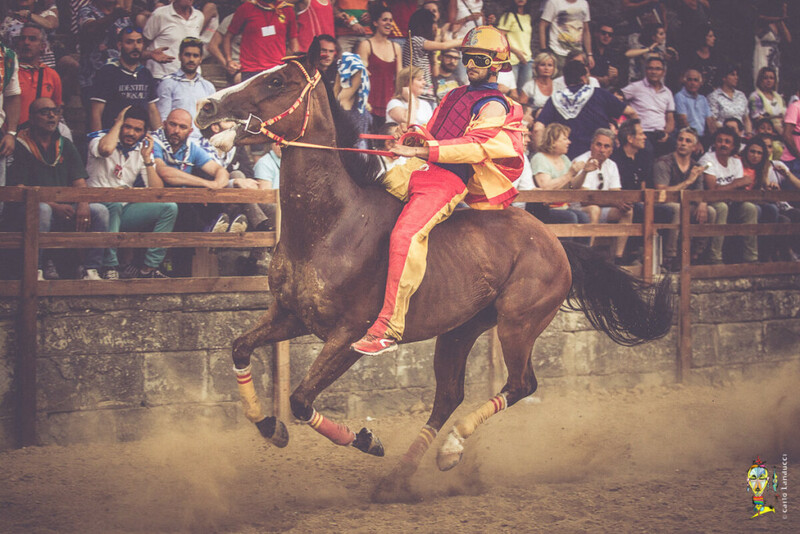 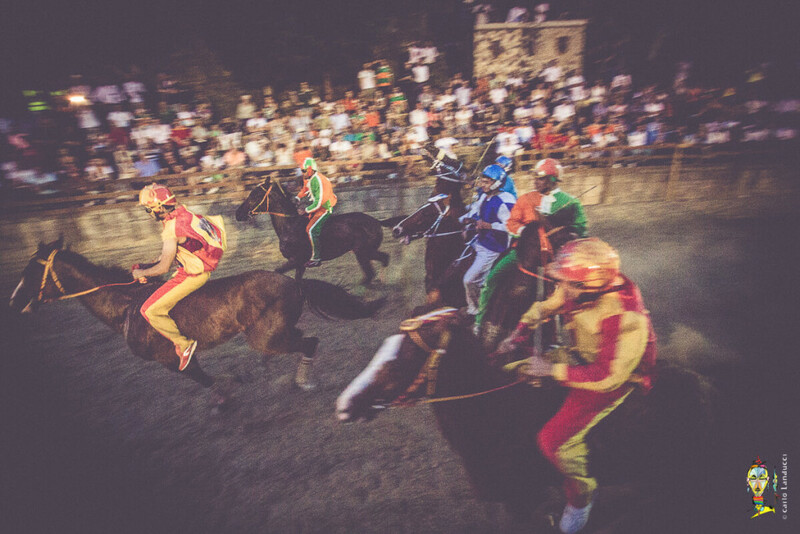 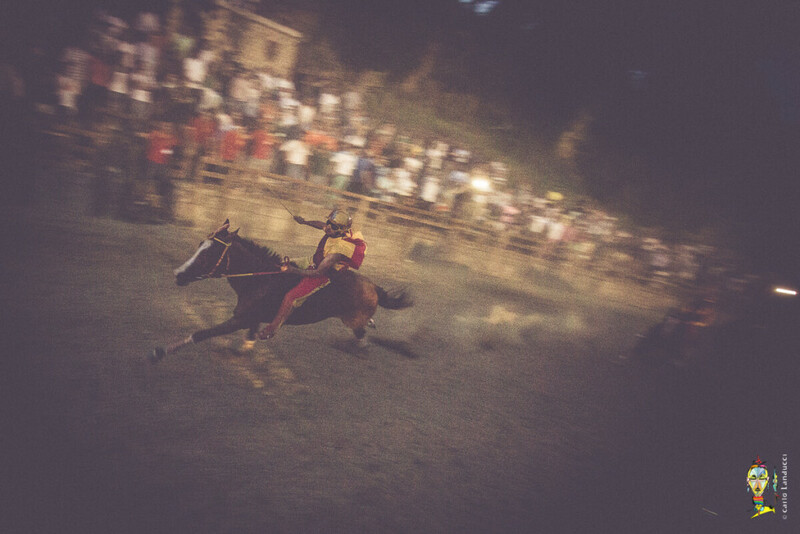 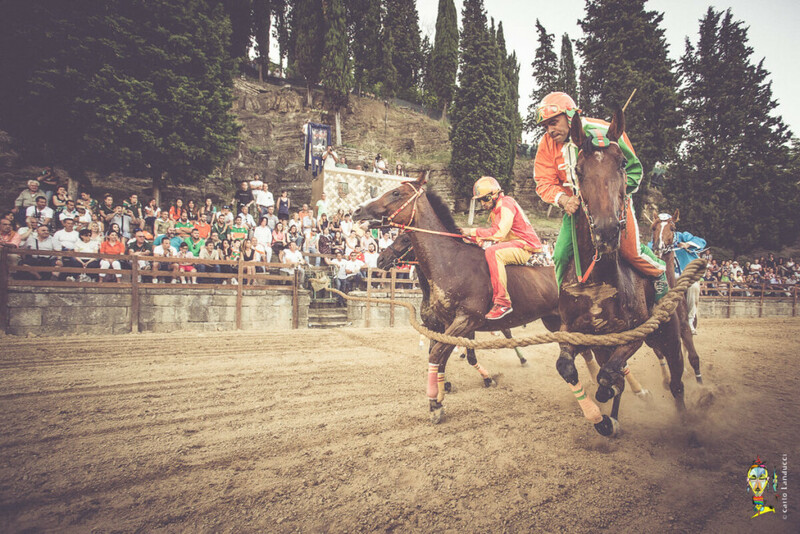 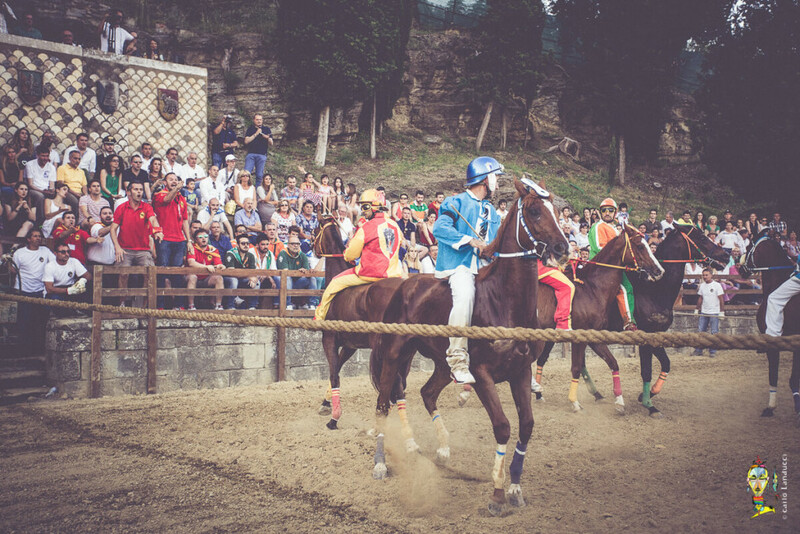 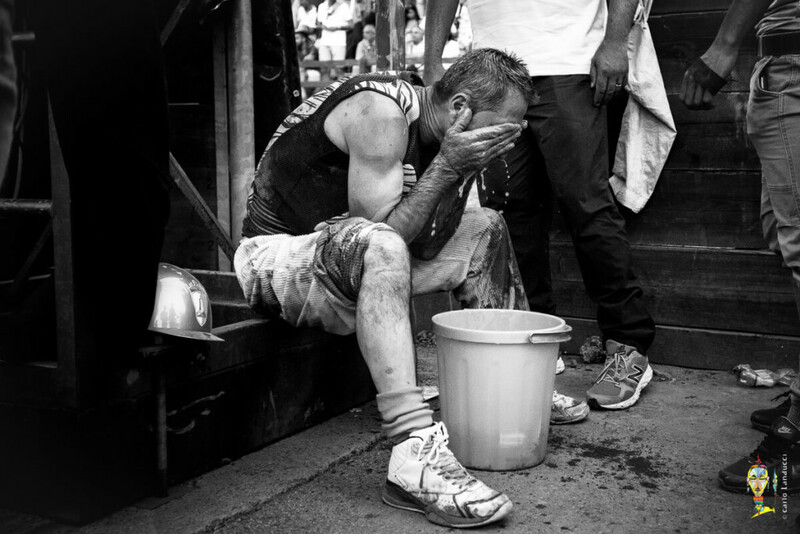 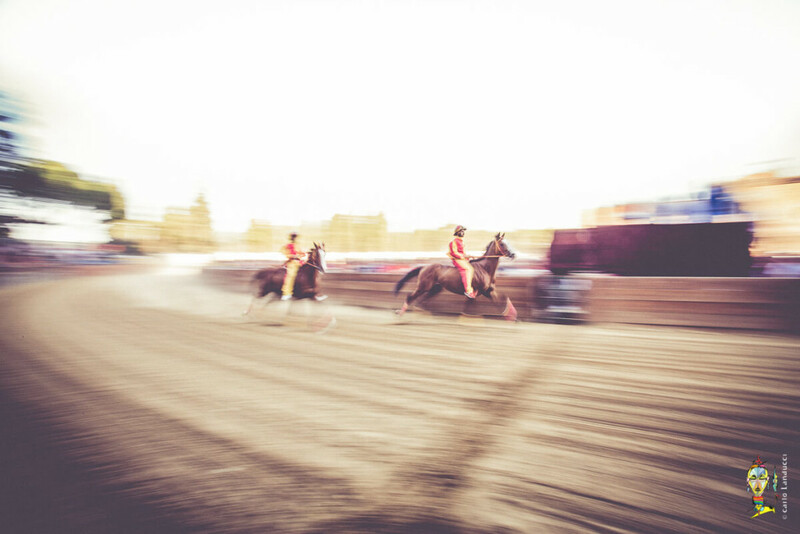 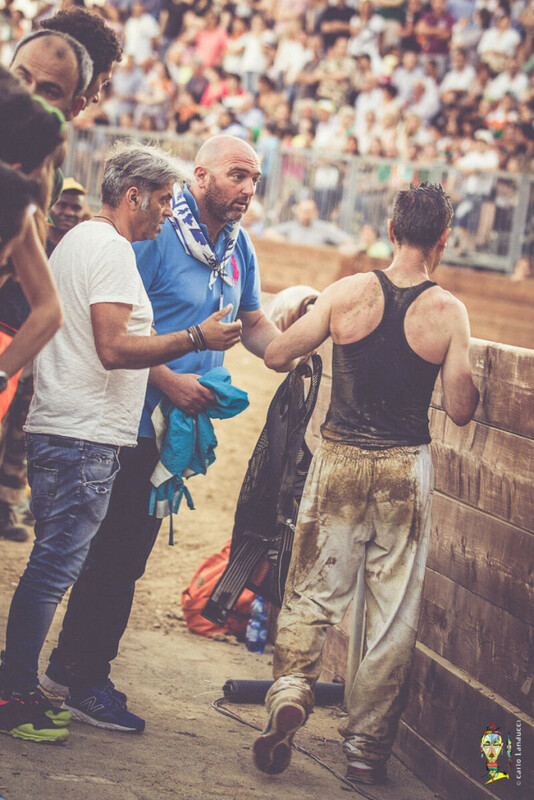 This event originated over a century ago; the documents of the time report that in the early editions the Palio was a long run race, from the straight road between Rio di Cozzano and Fontina, while sometimes came over from Bigurro Torrente to Il Passaggio. 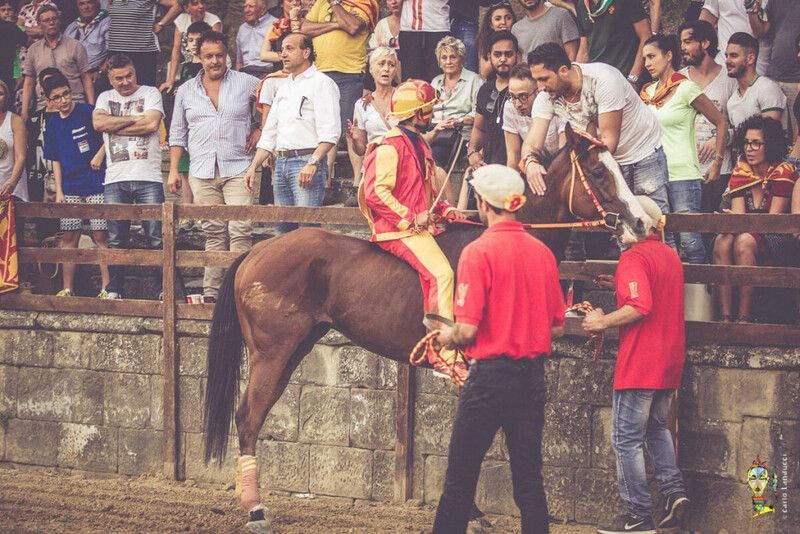 Later, the race was moved to Piazzale Garibaldi, its current location, that Castiglionesi call the “Parterre”, where was played for the first time on June 5, 1864; at that time it was called “Festival of Chiocane”. 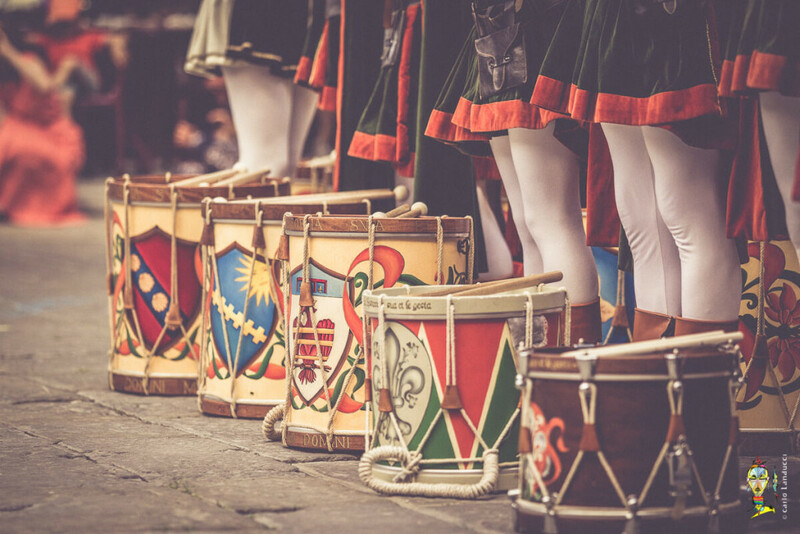 The “chiocane” were the bunches of cherries that boys presented to their girlfriends; some of them were rested on top of a soapy pole. 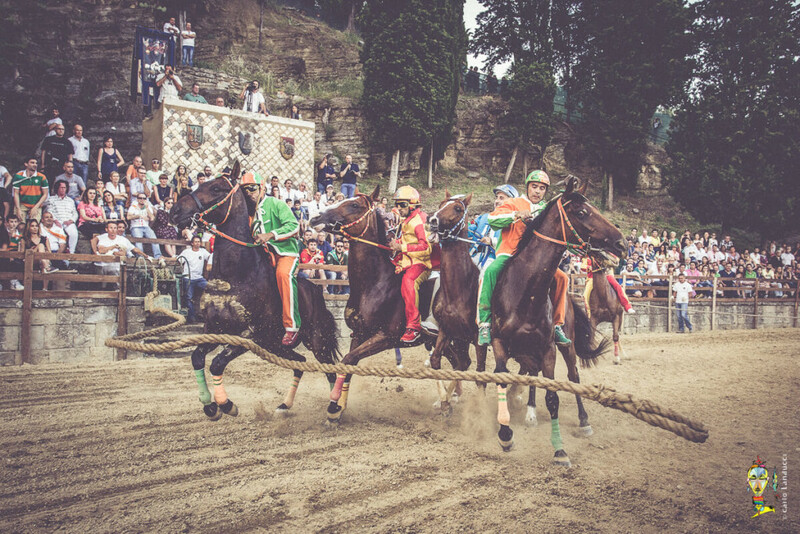 The ones who were able to take them were the winner of the challenge. 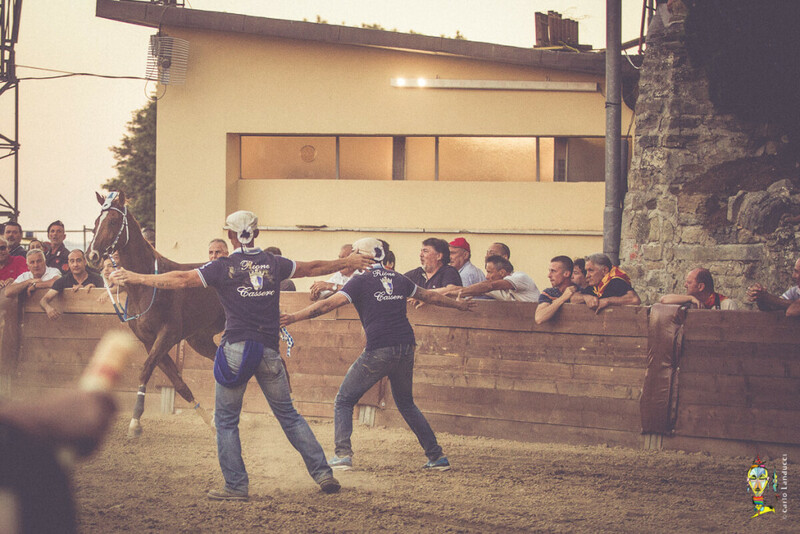 The Terzieri were created in 1932, taking up the ancient Terzieri in which the town was divided during the middleage, today still valid from the geographical point of view: the Terziere Sub or Sus Castiglione currently called Porta Romana, the Terziere Retina currently Rione Cassero and the third market or Porta Santa Maria corresponding today to Porta Fiorentina. 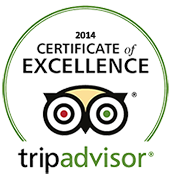 Coat of arms: the roman wolf suckling the twins. 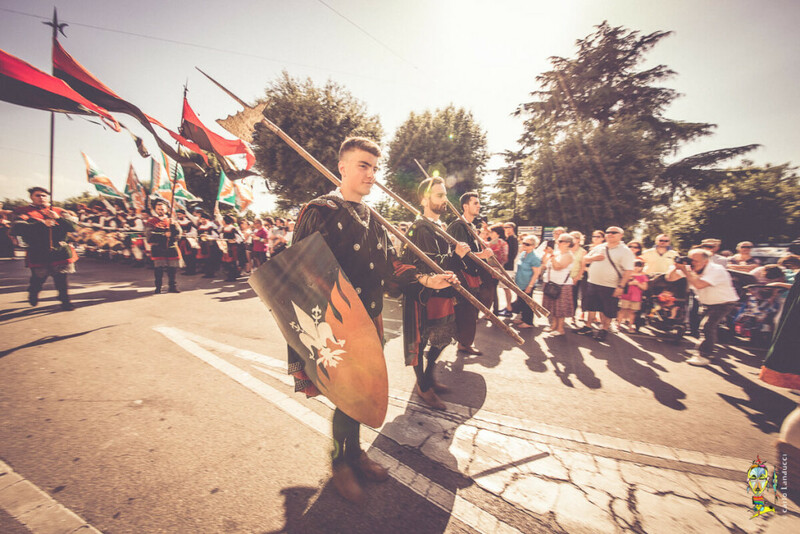 Territory: southern area of the city and the villages of Montecchio Vesponi, Pozzo Nuovo, La Nave, Castroncello and Brolio. 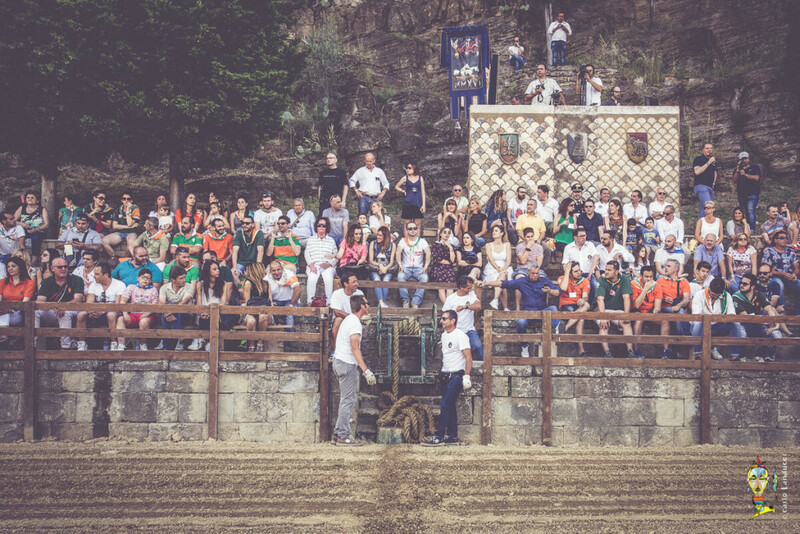 Coat of arms: the Tower of Castiglion Fiorentino called Cassero. 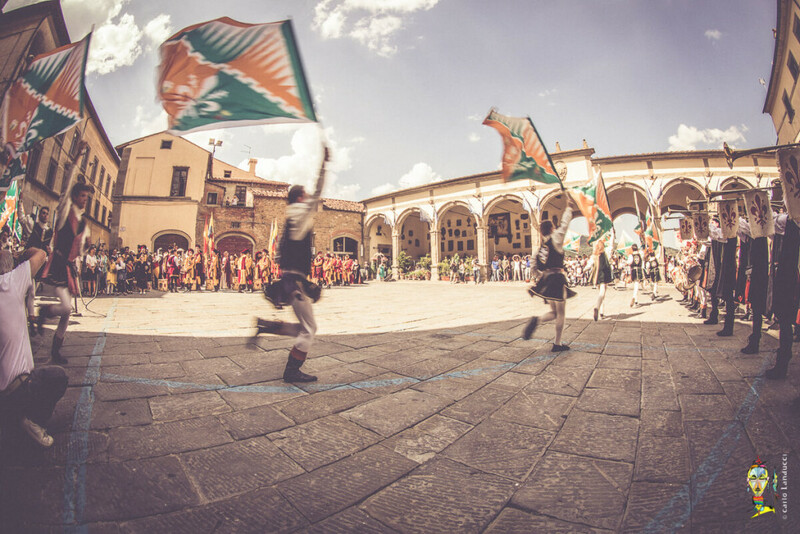 Territory: the central area of the city and the villages of Ristonchia, Orzale, Santa Cristina, La Badia, Pieve di Chio and Polvano. 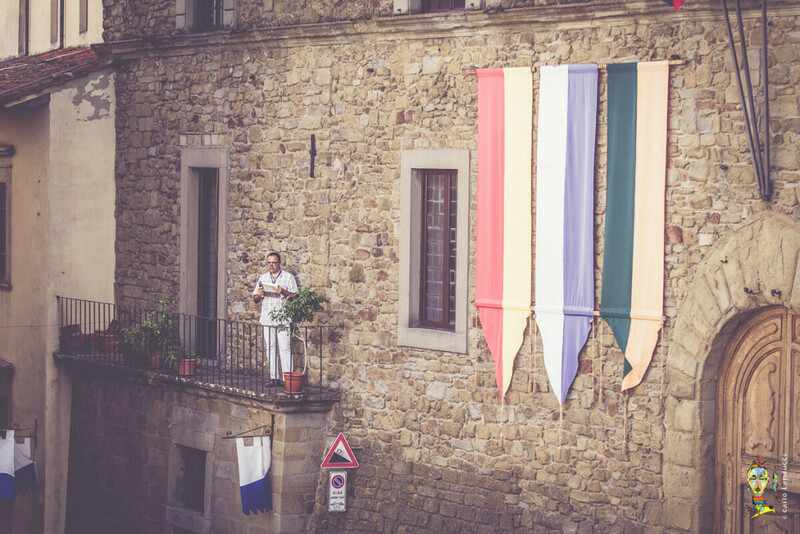 Coat of arms: Crest lily white buttoned. 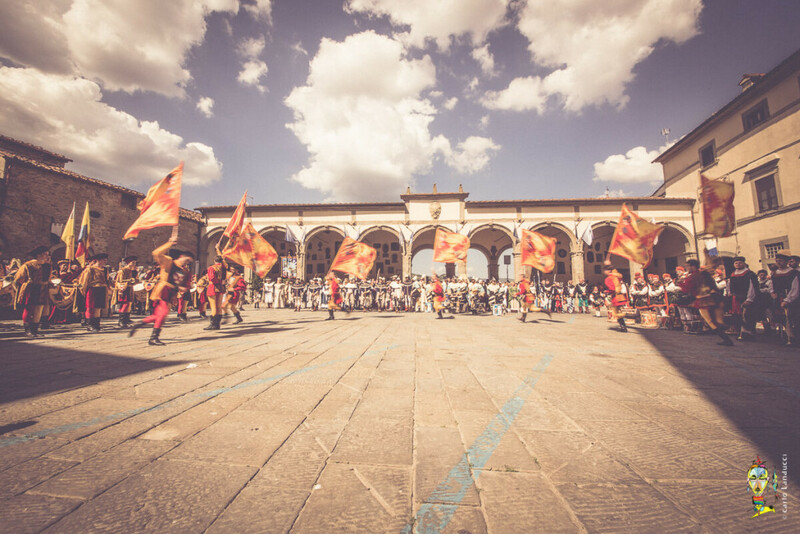 Territory: northern area of the city and the villages of Manciano La Misericordia, Mammi and Cozzano. 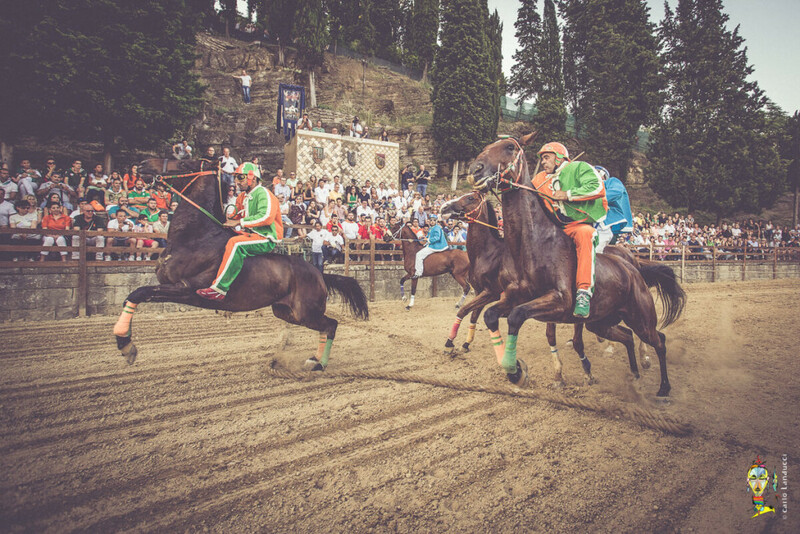 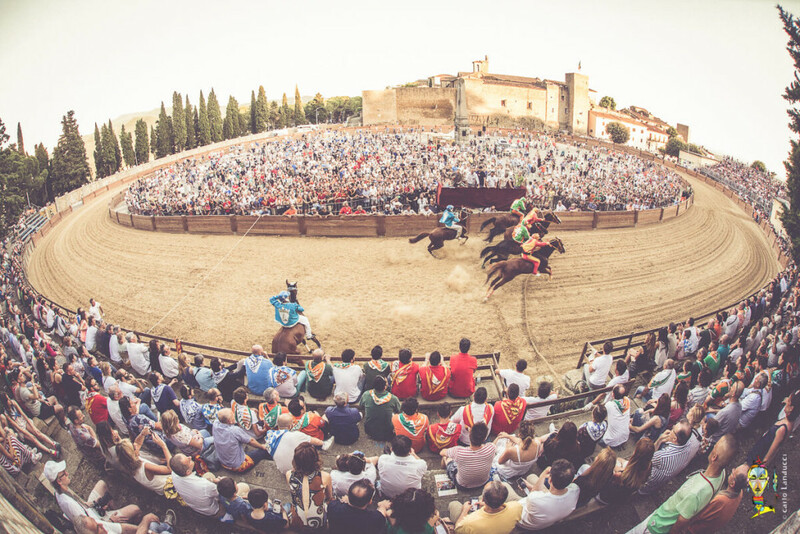 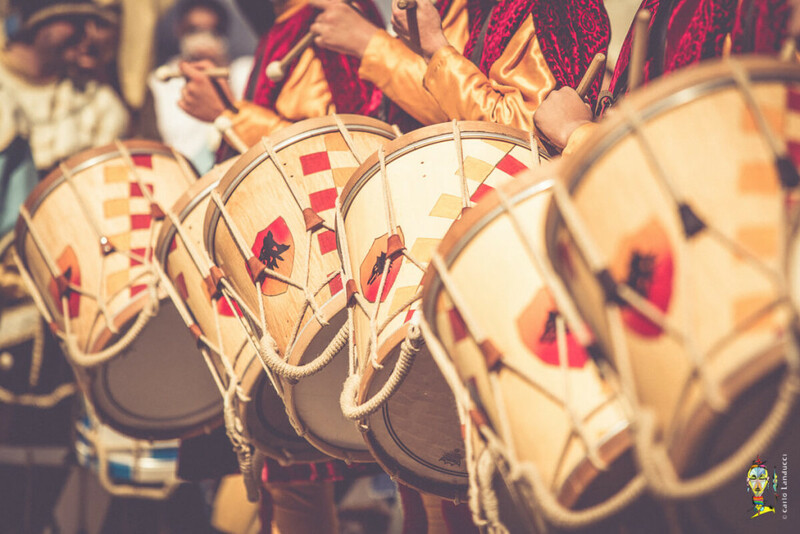 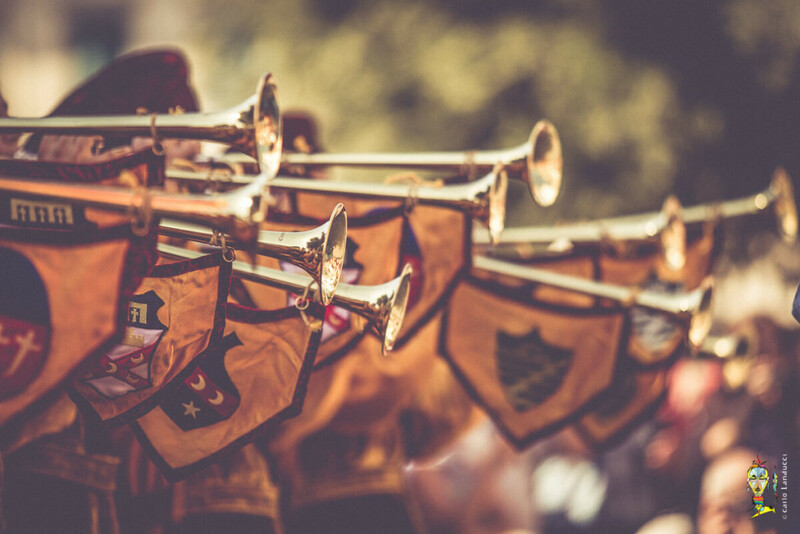 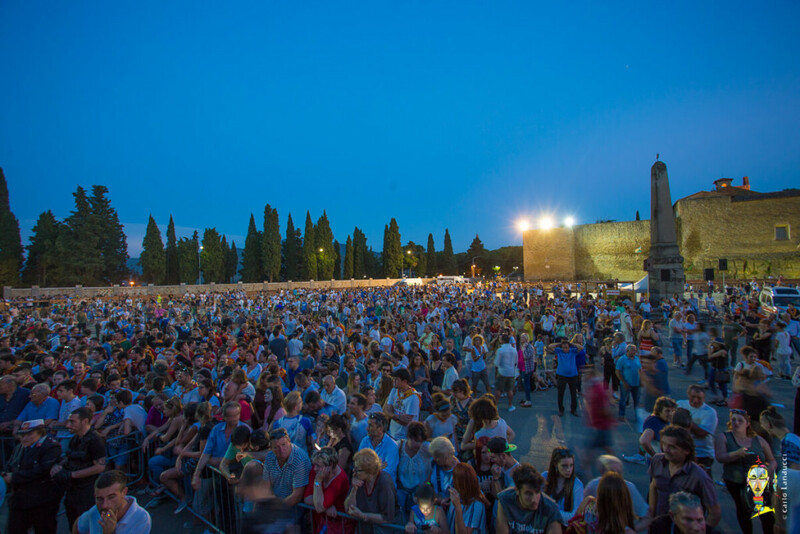 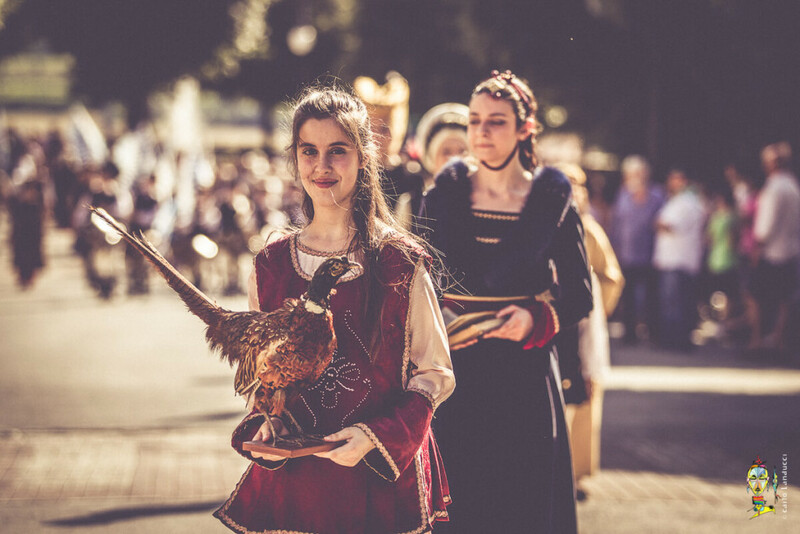 The event is eagerly awaited throughout the year and officially starts on the saturday before the race with a challenge between the musicians and flag bearers of the three districts and ends on sunday with the Palio and the feast that follows. 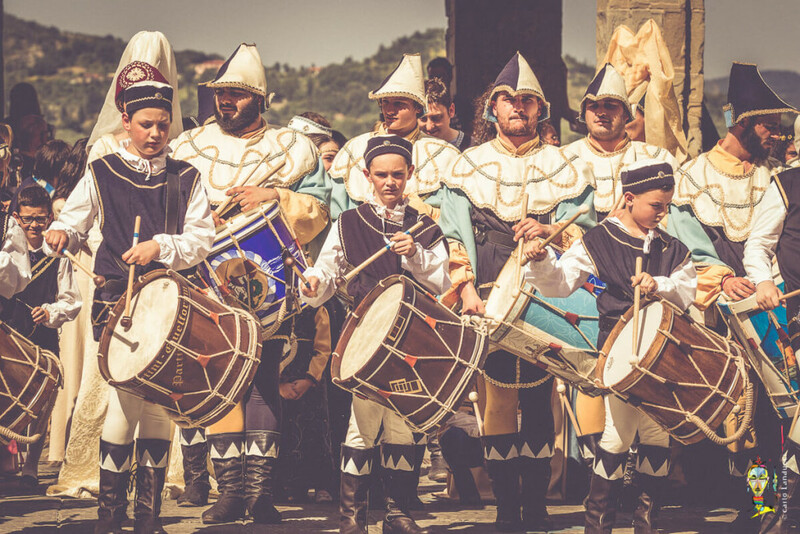 Throughout the week the districts are adorned with flags and other ornaments belonging colors, involving locals, citizens and tourists in folk celebrations and goliardic festivities. 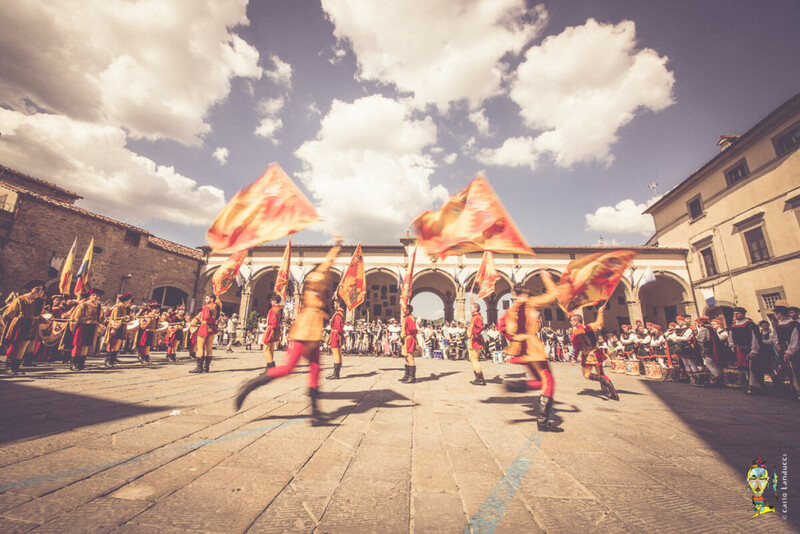 The day before the Palio is also held the Provaccia (or proof of the Palio which takes place on sundays) and every district organizes the propitiatory dinner. 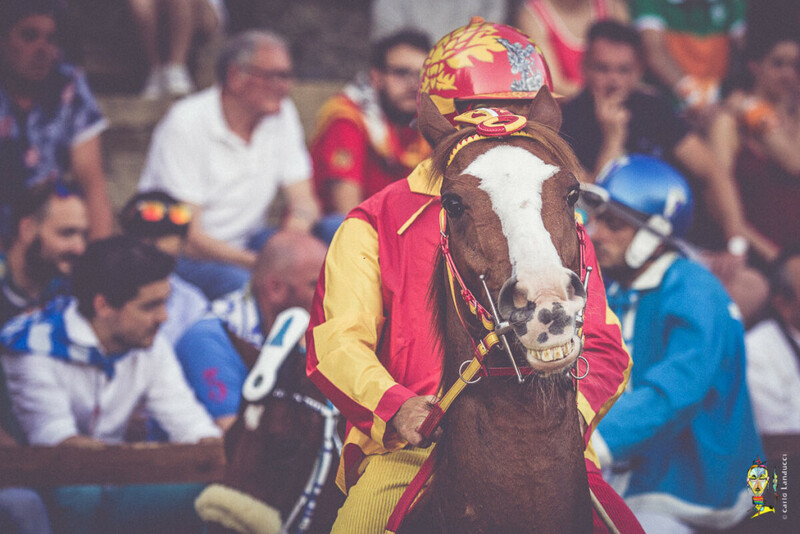 Sunday begins with the Blessing of the Horse and the investiture of the jockeys, and then continue with the historical parade in the afternoon through the streets of the town to Piazza Garibaldi where, around 19:30, begins the Palio. 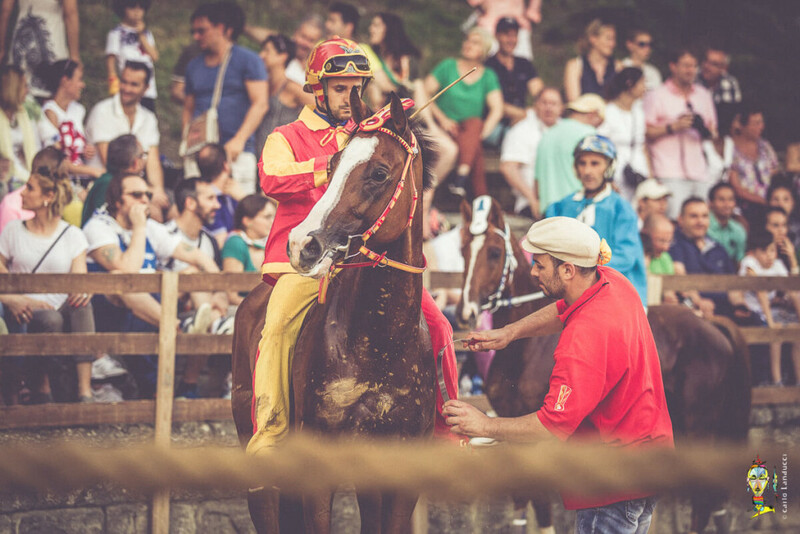 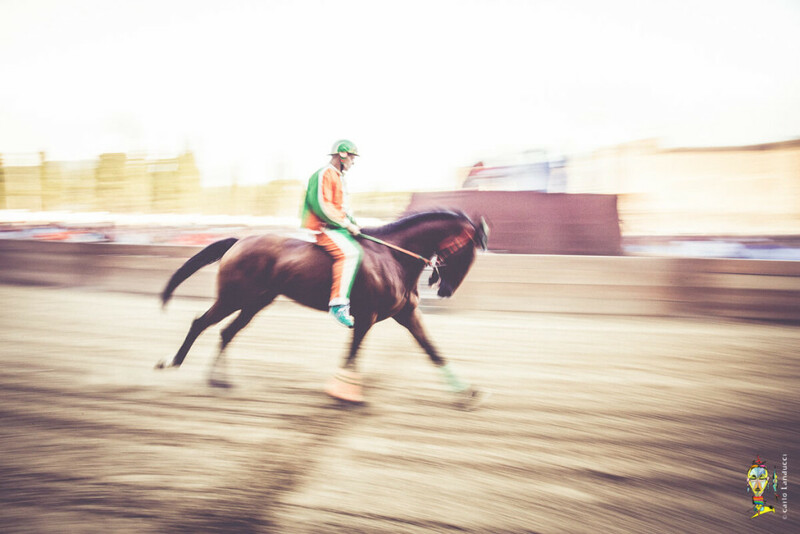 The horses – mounted “sleeping” – must do four laps of the track; the move is given by a canape and validated by a Mossiere. 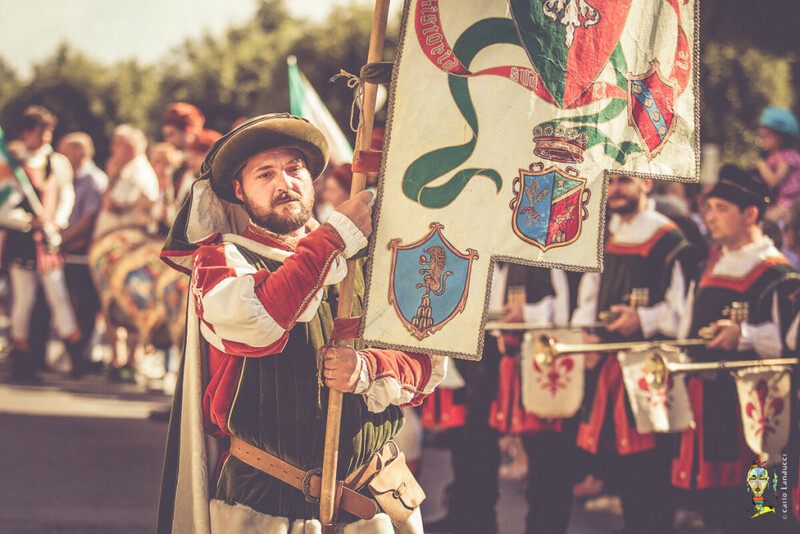 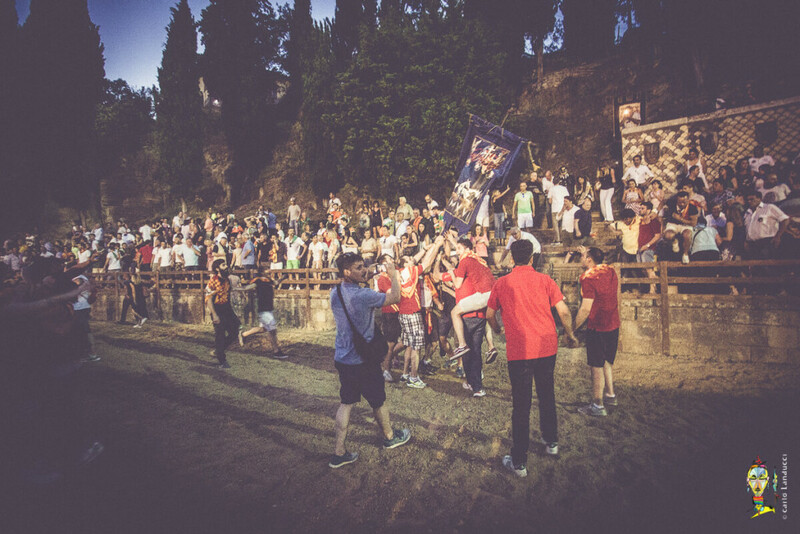 Once the Palio is over, the victorious district and its followers go with the “rag” to give thanks to Our Lady of Rivaio near the homonymous Church. 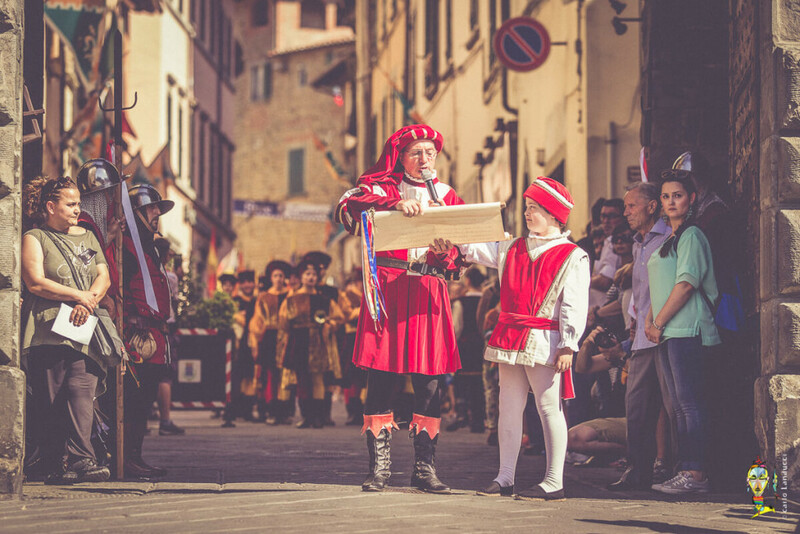 Immediately after, there is a local parade through the streets of Castiglion Fiorentino showing the Palio won and a party till late night. 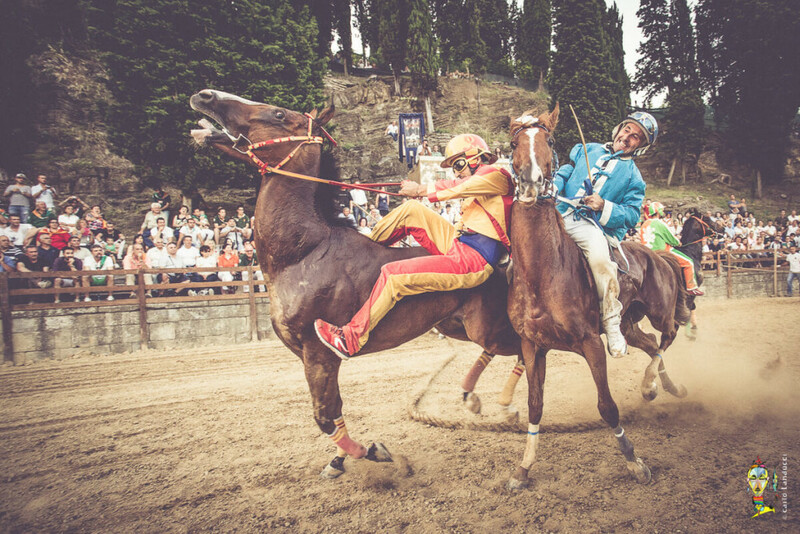 The following week there will be the Victory Dinner.